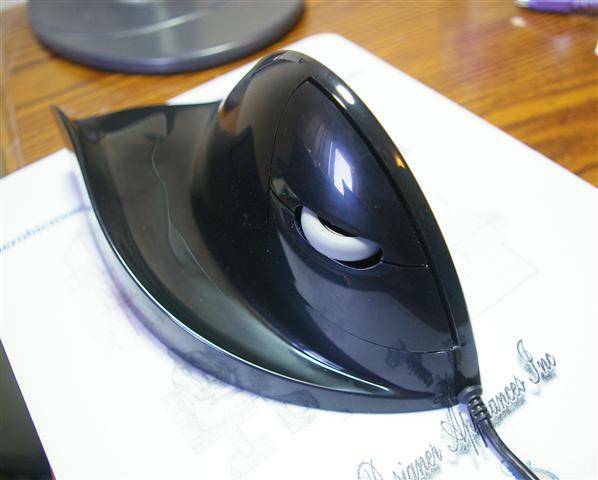 The Aerobic mouse improves the standard vertical mouse design by eliminating any need to grip the mouse. Combined with the recommended clickless mousing software, it is promoted as a “virtually hands-free mousing system.” Read on for my hands-on review. Update: Since the inventor of the Aerobic mouse passed away, the product’s future is unclear. As of Feb. 27, 2012, the units can still be found online, but a call to Designer Appliances was not answered. The mouse being reviewed here has been known by more more than one name. For a number of years it was called the Quill mouse. Fairly recently the brand was changed to “AirO2bic.” That’s pronounced “aerobic” – the O2 is there to represent oxygenation of your muscles, and the different spelling makes the name more unique. For simplicity, I will refer to it as the Aerobic mouse. Regardless of what you call the Aerobic mouse, its design is backed up by what seems like good medical research. I have talked to the inventor, Mr. Tom Large, and my layman’s impression is that he knows his ergonomics (though I can’t agree with his views on other things such as evolution). Tom does a good job of showing how his mouse addresses RSI using medical facts rather than marketing folklore. It all centers around the carpal tunnel, a passage through which “control cables” pass from your arm muscles to operate your fingers. Picture a bundle of wires in a conduit and you’ll have the right idea. Now picture that bundle of wires twisted. That’s what the tendons inside your carpal tunnel look like when your hand is flattened out to grab an ordinary mouse. If this sounds painful, that’s because it is. Tendons rub together in unnatural ways, things stretch that aren’t supposed to – and one night you wake up at 3:00 AM with your mousing hand on fire. Like other vertical mice, the Aerobic mouse addresses this problem by placing your hand in the natural “handshake” position, eliminating the twisting action. Unlike other vertical mice, the Aerobic requires no grip. This is a major selling point vs. the Evoluent vertical mouse, which does require some gripping action to operate. If all you do is simple tasks like web browsing and email, you have no reason to worry. Just turn down the mouse speed in your Windows control panel until you can put the pointer where you want it. After 2-3 weeks you will likely find that you can turn the speed back up somewhat without losing precision. If you do a lot of Photoshopping, you may need to buy a supplementary pointing device. I use a Wacom graphics tablet for this purpose, and it works well for me. In a typical office situation, keyboard trays are often neglected. Sitting in ordinary chairs, users work on desks 30″ tall or higher, which is courting RSI calamity. The design of the Aerobic mouse seems to assume that this situation will be rectified before you attempt to use the mouse. Unlike the Zero Tension mouse, which slopes up and away from the user to accommodate tall desks, the Aerobic has a slight negative slope. To grip it properly, the angle between your arm and your desk or keyboard tray needs to be 90 degrees or more. If it’s not, you should think about fixing that problem before you go shopping for any new ergonomic devices. A number of Internet reviews allege that the Aerobic mouse hardware is poorly made and doesn’t last. Tom tells me that many of these allegations are disingenuous and not based on actual experiences. He backs up this defense with a 2-year replacement warranty, which in my view is fairly strong evidence in favor of his product. I haven’t had the mouse long enough to form my own opinion on its durability. I can say that the click buttons have harder action than I would prefer. This doesn’t matter so much if you choose to use the recommended clickless mousing software. The Aerobic mouse is way too large to fit on a standard mouse pad. You probably wouldn’t want to put it on one anyway, because old-style mouse pads are actually designed to increase friction, a holdover from ball mice that is not needed by today’s optical models. If you have a smooth desktop, you will probably do fine just putting the Aerobic directly on it. If not, you may need to order Designer Appliances’ special Glidewell mouse pad. In addition to being twice the size of an ordinary pad, it’s ultra-smooth. It doesn’t quite give the polished-desk feel that I crave, but it’s a big step up from most other mousing surfaces. 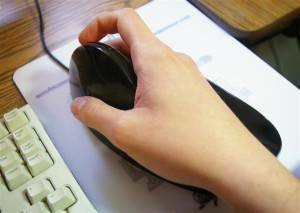 A big part of the “virtually hands-free mousing system” is clickless mousing. This is accomplished by the use of special software, and will actually work with any mouse. Here’s how it works: Instead of clicking on things with your mouse, you hover over them. After an adjustable pause period (the default is half a second) the software registers a click. For ordinary tasks like web browsing, this is a real finger-saver. It’s also not as much of an adjustment as you might think. For advanced work such as selecting text for editing, however, you’ll need to turn the software off using a hot-key. It can really work against you in certain areas. The cost of the Aerobic mouse is substantial, particularly if you spring for the “virtually hands-free mousing system,” which includes a license for the Nib clickless software. Nib, which has a 30-day trial included in the Aerobic package, does offer some advanced features that might be worth the price tag for certain users. I don’t recommend buying it, however, until you’ve tried free alternatives such as Point-N-Click Virtual Mouse as well. Just the Aerobic mouse itself will run you about $90 on Amazon.com, which isn’t much compared to the health of your wrists. Right and left hand versions are available, and there is a two-year replacement warranty. The Aerobic mouse was designed to accommodate people with disabilities such as severe arthritis. Tom reasons that if a disabled person can use an input device comfortably, the ergonomic benefit to a non-disabled person should be even greater. My brother, who has fairly severe RSI and gave up mice for pen tablets some time ago, has tried the Aerobic mouse and believes that it is probably the only mouse he could come close to using without harm. If you want to go straight to the top for the most ergonomically “correct” mouse out there, the Aerobic is a great choice. Disclosure: This review was made using a complimentary sample from Designer Appliances, which I gave to another person after finishing the review.